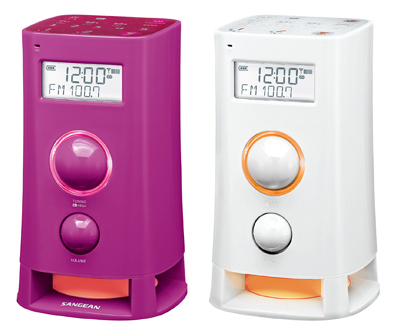 The Sangean K-200 multi-function upright AM-FM digital radio has been designed well. It provies crystal clear sound with deep bass tones. A one-touch cooking timer is built in if you use it in the kitchen! You can connect your iPod or MP3 player through the AUX in jack. The large illuminated LCD has adjustable brightness. The mood light in the base may be adjusted to 8 brightness settings. The AM and FM bands have 5 presets each. The built in clock has alarm-radio/buzzer/recorded message. Rotary tuning and rotary volume controls are featured. Insert four C cells (not supplied) for backup power during power outages. This radio is available in dramatic pink or white.